What is Peer Victimization and How Does It Relate to Bullying? Peers play a crucial role in shaping school culture and determining whether the school climate is supporting of bullying behaviours. Peers often pick up bullying behaviours from seeing their peers bully and peer groups can help reinforce negative bullying behaviour and peer pressure bystanders into bullying. Asides from bullies and victims, there’s a third role students play in bullying: that of the bystander. Kids need to be taught that even if they’re not doing the bullying themselves, they’re still supporting a climate of bullying by not doing anything to help the victim or inform responsible adults. Bullies hang out with bullies. 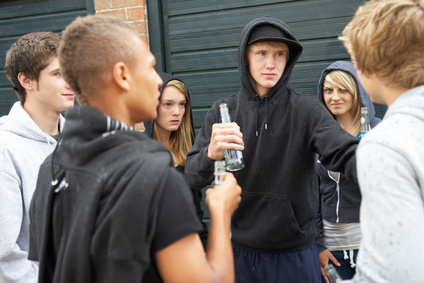 Peer groups of bullies often serve to reinforce the negative behaviour (e.g., offering verbal encouragement to the bully, holding downthe victim, etc). Splitting up these negative peer groups can help make the classroom environment less amenable to bullying and reduce peer pressure bullying. Identify and reward positive leaders in the class that set a good example for other students. Ensure that bullying is not rewarded and appropriate consequences are dealt for acts of bullying. Reporting bullying can be frightening for students who fear reprisal from the bully. Do students know how to report acts of bullying? Do students feel safe reporting bullying? Steps must be taken to ensure students know how to report bullying and that they’re able to do it in a safe and supportive manner. Online bullying reporting is ideal for this! Create a safe school environment by identifying and disassembling peer groups doing the bullying and reducing peer pressure bullying. Identify the bully ring-leader and engage them in efforts to redirect their energies towards better causes. Parents of both the bullies and victims must be involved. The home environment of the bully is especially important in teaching the bully how to manage aggression and deal with problems.